Several hundred protesters opposing Donald Trump gathered on Friday outside the hotel where he was scheduled to speak to California Republicans, and a large contingent of police sought to head off violence like what followed a rally in Southern California the night before. "It went gangbusters. They attacked me," said Chris Conway, who identified himself as a mortgage broker from San Mateo. 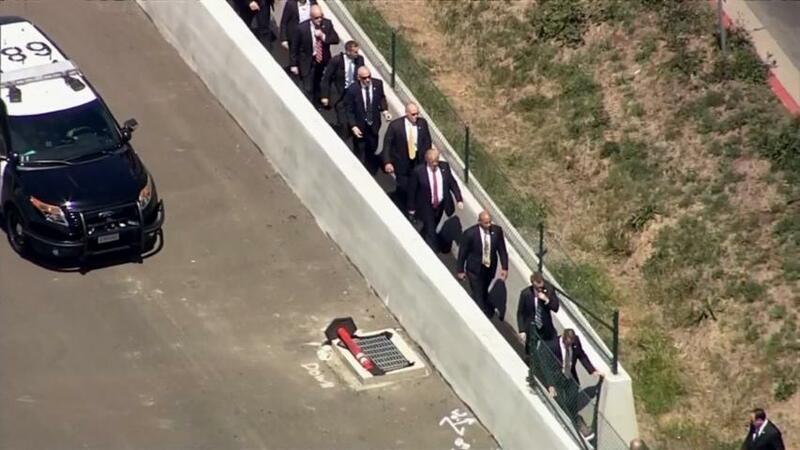 Trump was escorted to the venue by a fleet of black SUVs and police. He had to enter through the back surrounded by scores of security personnel. "It was like I was crossing the border," Trump mused during a speech at the California Republican convention. While Trump held a rally at a fairgrounds amphitheater, dozens waved anti-Trump signs outside in mostly peaceful protests and traded insults with masses of the candidate's supporters who had lined up to see him. Later in the evening, however, the protests swelled, grew rowdy, and spilled into the streets. One Trump supporter had his face bloodied in a scuffle as he tried to drive out of the arena. One man jumped on a police car, leaving its front and rear windows smashed and the top dented, and other protesters sprayed graffiti on a police car and the Pacific Amphitheatre's marquee. Earlier in the evening, a half-dozen anti-Trump protesters taunted those waiting to get into the venue. Trump supporters surrounded one man who waved a Mexican flag and shouted, "Build that wall! Build that wall!" — a reference to Trump's call to create a barrier between the United States and Mexico to stop illegal border crossings.